Also known as countertop snapframes, our counterstand snapframes are available with optional clip and support features. They also allow the users to switch the orientation of the poster displays between landscape and portrait. They are available in two sizes and with a wide range of finishes. 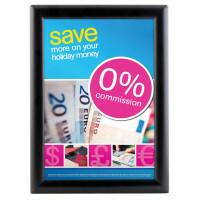 It is easy to change the posters displayed on these aluminum snapframes that open outwards.